Before you start creating and sharing content on your blog, you'll need to configure your settings. You can customize your blog's root URL, date format, comments options, subscription email settings and more. Use the Select a blog to modify dropdown menu to choose the blog you want to customize, or click Create new blog. You can create a new blog, delete a blog, or manage your basic settings for your blog. You'll fill in these settings before you start blogging and sharing your content. Blog name: enter or edit the name of your blog. This is an internal name only, used to segment this particular blog’s performance in the blog’s overview tool. Blog header: if your blog templates use the public title tag in the header, add the title you want used for your blog here. Page title: the page title shows up in the browser tab and in search engine results. We recommend this title be no longer than 70 characters. Meta description: this is the summary that will appear in search engine results for your blog. Blog root URL: use the Blog root URL dropdown menu to choose the domain your blog is hosted on. If you'd like to add a subdirectory (e.g. /blog or /news), enter the subdirectory into the text field. This URL will be the URL of your blog listing page and the root URL of your blog posts. In your blog's Templates settings, choose the template applied to your blog and blog listing page. You can also customize how your blog posts render on the listing page and add any customization to the HTML and CSS here. Use the Current template dropdown menu to choose the template applied to your blog posts and blog listing page. Click to clear the Use same template for blog listing page checkbox if you'd like to choose a different template for you blog listing page. Check the Show summaries on listing page checkbox if you'd like your blog listing page to feature the content of your blog post up to the read more separator. Check the Use featured images in listing summaries to include the featured image of each blog post on your blog listing page. You can also customize the header or footer HTML of your blog or apply stylesheets here. Learn more about how to customize your template settings. Your blog Subscriptions settings is where you can enable and edit your blog notification emails. Switch the Enable blog subscriber notification emails toggle on to enable blog email notifications. Use the toggle switch for each blog notification Frequency to enable or disable each email type. Keep in mind that your blog subscription form should reflect the same frequency options you enable in your blog subscriptions settings. 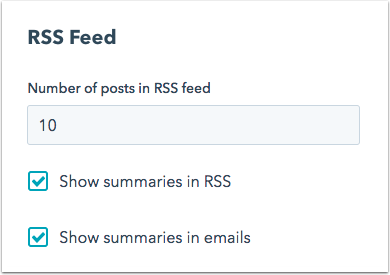 In the RSS Feed section of your settings, you can customize the way your blog posts appear in your RSS feed and in the post feed in your blog notification emails. Enter the number of blog posts features in each blog notification email. Use the checkboxes to indicate whether to feature summaries of your blog posts in the RSS feed or in your blog notification emails. Learn more about how to manage your blog subscription form, emails, and settings. Your blog's Language settings determine how the dates are formatted in your blog posts and blog listing page. 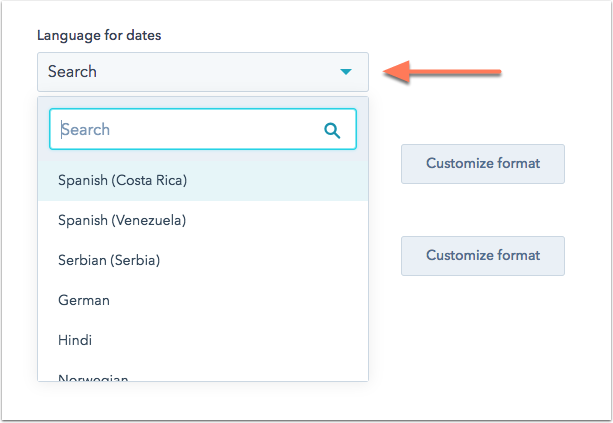 Use the Language for dates dropdown menu or the search bar to choose the language for your blog date format. Use the Publish date format dropdown menu to choose the format for your blog post publishing dates. These formats will correspond to the Language for dates selected above. 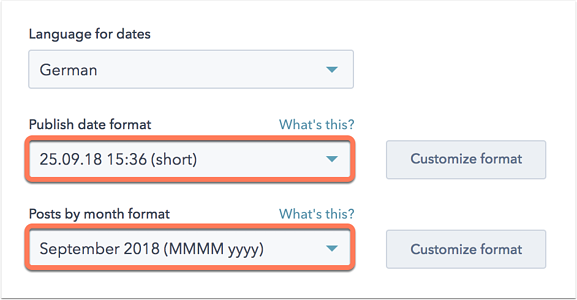 Use the Posts by month format dropdown menu to choose the date format for your blog listing page. Please note: the date formats available for selection correspond to the language for dates you've selected. If you're comfortable working with code, you can also choose to use a custom date format that you create using Locale Data Markup Language. You can find more information on using LDML by clicking What's this? on the settings page. In your blog Comments settings, you can manage blog comment notifications, moderator settings, and more. Switch the Enable commenting toggle on to allow visitors to leave comments on your blog. Check the Allow comments to create contacts checkbox if you want new visitors who leave a new blog comment to be added to your contact database. Check the Moderate comments checkbox if you want blog comments to be approved by your team before they're published. Use the Who should receive notifications of new comments on this blog dropdown menu to choose which users on your team should receive notifications to review your blog comments. Customize how many levels of comments can be threaded using the Threaded comments (level) dropdown menu. The more levels added here, the more levels of reply comments visitors can leave on existing comments. Learn more about how to configure your blog comment settings. Enable social sharing icons so readers can quickly and easily share your content with their followers with one click. You can include a share icon for Twitter, LinkedIn, Facebook, and Google+. The counter for each social media sharing icon shows the number of times your blog post URL was shared on that network. Click the Social Sharing tab. 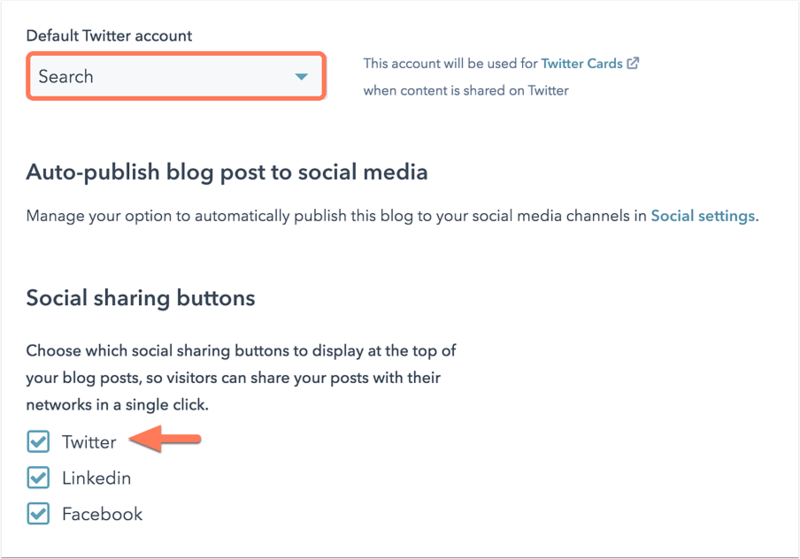 If you'll be including a Twitter social sharing icon, use the Default Twitter account dropdown menu to choose the Twitter handle featured in blog posts shared via Twitter Cards. Learn more about how to connect a Twitter account to HubSpot. Check the social media channel checkbox for any social sharing icons you want to include on your blog. 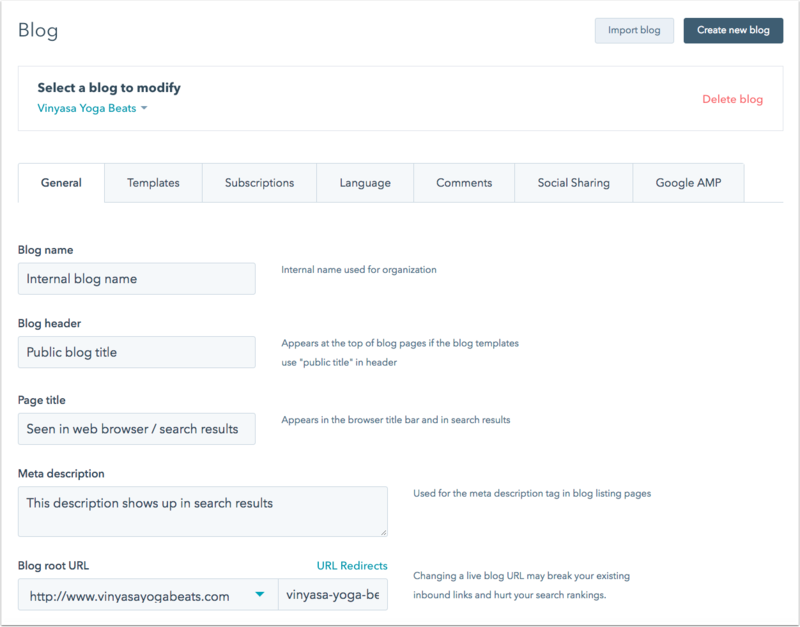 In your AMP settings, you can enable AMP for your blog posts and customize the settings for your blog logo, fonts, and colors to standardize how your blog posts load over mobile. Learn more about how AMP works and how to enable AMP for your blog.